I had just returned from having spent 10 days at a Buddhist monastery in the north of Thailand. The silent retreat, called Vipassana, was thought-provoking to say the least, and created a huge shift in how I would live my life. Whereas before I was cruising along waiting for things to happen, now I desperately wanted to be in charge of my life and control my own destiny. When you are in complete silence for 10 whole days your whole life flashes before your eyes. At the retreat I realized I wanted, nay needed, to change the way I lived my life. However, my past comprised of a series of so many broken pieces that I did not know how exactly I could ever become whole again. At the end of the ten days I went to Bangkok where I had some personal and professional affairs to put to bed. There I packed and unpacked, donated stuff that no longer served me, things that were no longer relevant to where I wanted to take my life. “It was the summer of 1989, and I was showing my St. Pucchi bridal collection at the World Fashion Fair in Osaka, Japan. At dinner one evening, a Japanese client handed me a beautifully wrapped gift. That gift remained in its original wrapping cloth, called furoshiki , forgotten for more than two decades all through my move from Bangkok to Dallas to Los Angeles when I finally unpacked the last remaining boxes. They say the teacher appears when the student is ready, not a minute sooner and not a second later. Apparently, this was the right time as my attention was now drawn to the beautiful gift. I gently peeled off the furoshiki and opened the carved, wooden box that revealed a gorgeous jade bowl with golden veins running through it. Kintsugi art dates back to the late fifteenth century. Legend has it that the craft commenced when Japanese shogun Ashikaga Yoshimasa sent his favorite tea bowl—a chawan—that was cracked back to China for repair. Upon its return, Yoshimasa was displeased to find that it had been mended with unsightly metal staples. Clearly this was less than esthetically pleasing. The shogun immediately tasked Japanese craftsmen to come up with an alternate, more pleasing method of repair. And thus kintsugi was born. How fascinating! This evoked intriguing thoughts because beholding the artistry of kintsugi, I could immediately see its transformative power. The bowl in my hand was more beautiful for having been broken. While the original form was forever destroyed, the essence of its beauty not only survived, it had been enhanced. And I thought…if such astounding beauty can emerge from shards of a shattered bowl that was once pristine, could a similar transformation also be possible with the parts of us we believe are shattered beyond repair to create a stunning masterpiece? In other words, can putting the pieces of one’s broken life back together help transform and lead to a total reinvention of the self in which the shattered pieces are alchemized into a beautiful, thriving masterpiece? Kintsugi gives new life, healing, and rebirth to damaged or aging ceramic objects by celebrating their flaws and history. I learned that the repair is done with lacquer dusted with powdered gold, silver, or platinum. 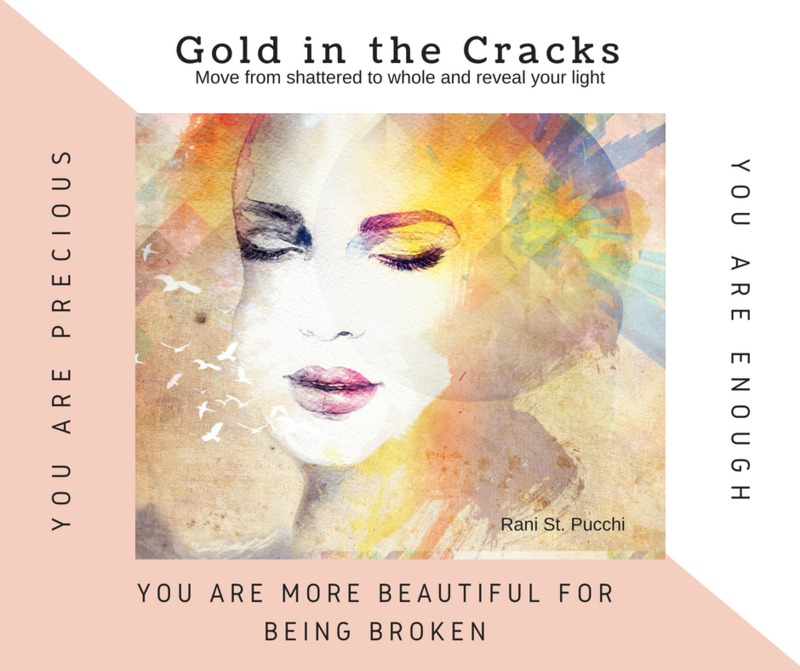 The cracks are filled in with gold. As a philosophy, kintsugi treats breakage as part of the history of an object and focuses on its hidden beauty with the understanding that rather than something to disguise, the piece is more beautiful because it has been broken. The Japanese believe that when something has suffered damage and has a history, it becomes more valuable. However, from what I’ve since learned from a kintsugi master, what is not apparent is the time and patience it takes to gather the broken pieces and fill in the cracks. Each crack is unique, and to fill it properly and make it stronger, one must figure out which kind of lacquer is best to use and continuously monitor, adjust, and refine the tiny details. It feels as if the broken bowl is talking to you as you touch and feel each broken piece with the hands of your heart, the lacquer running through it like bloody veins, and the gold adding to its beauty. There’s an intention that’s expressed as you invest time, energy, and intelligence to fix something that will be a part of your life, which perhaps you might use to consume food or drink. The kintsugi master is essentially expressing that a broken vessel deserves more than just being forgotten and replaced and is worth the investment of time so that it can continue to exist. Similarly, we are all trying to heal emotional wounds and rebuild our lives so we can become stronger. Kintsugi teaches us that nothing lasts, nothing is finished, and nothing is perfect. We are all works in progress, and each scattered piece of our lives is precious and worth embracing. Many people talk about feeling “broken” after enduring heartbreak, grief, and trauma. It’s time we rethink our philosophy of life and remember there’s an entire art dedicated to filling in the cracks of broken things with lacquered gold, an art form that proves that even the broken and damaged history of an object is beautiful and should be treasured. I love the concept of kintsugi. It’s such a wonderful metaphor for life. Every wrinkle is a road map of your life journey; every scar a solemn decoration, a perception that writes timeless poetry upon flesh and mind, like the stroke of a painter’s brush dipped in golden paint, creating art that is timeless despite the wrinkled grooves, deep creases, torn and broken parts. For that is where true beauty emerges. So when you feel broken and worried about how to get back to where you were, think about this and how a master potter can reconstruct what was broken into a masterpiece worth more than it was before. The repair is not carried out to disguise but rather to illuminate the damage, a celebration of strength. Rani St. Pucchi is an award-winning Couture Fashion Designer, Style & Image Consultant, and a Relationship Expert. She is a Bestselling Author, an Inspirational Speaker, and a Success Coach and Trainer. Her TEDx talk: Is Your Body Image Holding You Back? has received worldwide acclaim. Rani’s#1 International Bestselling Books, Your Body, Your Style: Simple Tips on Dressing to Flatter Your Body Type ; The SoulMate Checklist: Keys to Finding Your Perfect Partner; Your Bridal Style: Everything You Need to Know to Design the Wedding of Your Dreams; and Gold in the Cracks: Move from Shattered to Whole and Reveal Your Light are available on Amazon and at Barnes & Nobles. At 37/38 years old, I just had the best year of my life. Here’s what happened / how I did it.